Winegrowing is reviving in Belgium and is on the way to a solid future. Passion and global warming are surprising, aren’t they? After scattered beginnings in the eighties and nineties, wine growing and winemaking in Belgium have been experiencing a true revival for 20 years now and is really successful at the moment. Professional economic actors are positioning on the market. 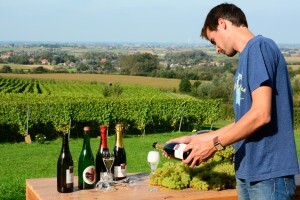 There are around 120 vineyards in Belgium among which some 30 are important. Each region, wherever it is located, to the west, east, south or in the centre, can be proud of a brand new winery, a wine estate, a wine castle or a wine growing farm, each managed by one or several passionate winemakers. In each region there is an amateur vineyard with members cultivating a love of wine. 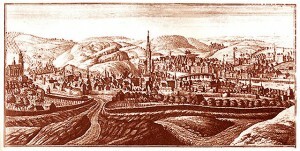 Remacle Le Loup – 1740 – etching representing the town of Huy. On the left : vineyard of the Croisiers convent with the enclosing wall. Viticulture then continuously declined. The onset of a Little Ice Age favoured market gardening as well as beer which is less delicate to produce and therefore gained in popularity. Thanks to the new means of transport the French wines could be imported more easily and last but not least, the political troubles imposed saving measures. Winegrowing reappears in the early sixties thanks to Charles Legot in Wallonia and or shortly after with Jan Bellefroid in Flanders. Hageland which is located in the Flemish Brabant, close to Leuven, was the first AOC seal (Appellation d’Origine Contrôlée) and was created in 1997 and followed in 2000 by Haspengauw, located in Limburg close to the border with the Netherlands. The first Wallonia’s AOC was created in 2004, Côtes de Sambre et Meuse and finally for the still wines, Heuvelland located to the west, close to the French border, gained its denomination in 2005. Now there are also AOC seals for quality sparkling wines from Flanders and Wallonia. Some winemakers have planted traditional grape varieties, others interspecific grape varieties.